This post was first published at PROSPECT BLOG. 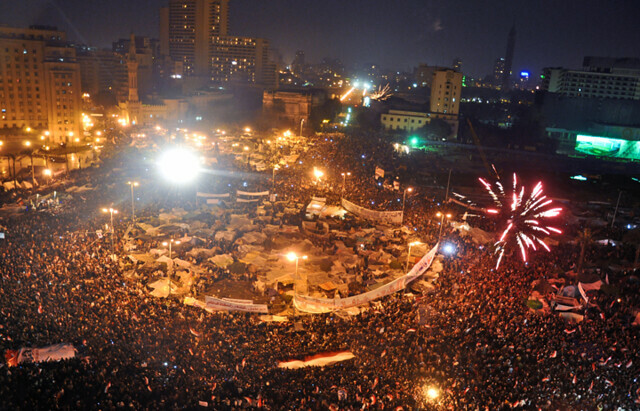 The events of the Arab Spring have rocked the world. In less than a year, unprecedented democratic protests across the Arab world have unseated autocratic governments in Tunisia and Egypt, threatened the ruling regimes in Syria and Bahrain, and sparked the Libyan civil war that overthrew the brutal government of Muammar Qadaffi. However, the Arab Spring is still unfolding, and its ultimate outcome in many Arab countries is still uncertain. Important questions remain: what factors caused these protest movements to unfold so dramatically, and are they likely to continue in the future? Similarly, the Obama Administration’s response to the Arab Spring remains controversial, both in the US and abroad. To answer some of these questions, I was able to sit down with UCSD history professor Dr. Michael Provence, an expert on Middle Eastern history and author of The Great Syrian Revolt and the Rise of Arab Nationalism to discuss the causes and future of the Arab Spring. Prospect: Many Middle Eastern countries have had a long history of stable autocratic governments, at least for the last thirty years. What conditions, in your opinion, allowed a mass democratic protest movement like the Arab Spring to emerge now for the first time in decades? Dr. Provence: It seems that there were lots of things that coalesced. There is the demographic issue of young population who are educated and worldly and engaged in digital media, paying attention to the news and who are not well employed — either unemployed or underemployed. Additionally, there is the issue of official corruption which has been made more front and center by WikiLeaks releases, and there’s the likelihood that governments in the region will be passing succession to people who are younger, and considered unqualified and extremely corrupt like President Mubarak’s son Gamal Mubarak in Egypt. These feed the belief that things will not get better, because the people who are in power will continue to subvert the system to make themselves rich and deny everyone else a voice. Governments have responded to these movements — which are in the eyes of most people legitimate — with delusion, violence, and repression, responses that have undermined their legitimacy. Prospect: How important would you say that communications technologies like mobile phones, Facebook and Twitter have been the success of the these protest movements? Could the Arab Spring have happened without them? Dr. Provence: There were protest movements before we had [these technologies] and there would have been protest movements if we didn’t, but they would not have been the same. One thing that’s interesting is that in Syria, where there’s no unofficial media and no journalists that aren’t working for the government, people have combated, undermined, challenged and critiqued the official narrative of events with digital technology — with their cell phone cameras, with videos, with media that they’ve uploaded to Facebook immediately. In some cases they’ve done this as soon as an official version is broadcast and they’ve become quite sophisticated, and far more sophisticated than the government in the use and manipulation of this technology. So uprisings would have happened, but they would have been different uprisings in important ways. Prospect: Do you think that mass protests are going to become a much more common feature of Arab politics in the future? Dr. Provence: It’s hard to say. I doubt it, and I think the best thing that one could hope for would be more just, more representative and more equitable political configurations would emerge; one can say more democracy, more representation and less corruption and succession by election. If these things do not emerge, and I hope that they do, people will protest. In Egypt people have protested for a long time. I visited Egypt a few years ago, and at that time people were protesting the price of bread. The IMF had told the Egyptian government that it had to reduce the subsidies on the price of bread — bread was subsidized heavily — and it’s what people eat if they’re poor. There are a lot of poor people in Egypt, and the government said ‘we have to serve the IMF, they hold our loans and if we don’t do what they say we won’t get more’ so they cut the subsidy on bread. People couldn’t buy bread, they couldn’t eat, so they went out onto the streets. Those kind of protests take place and a lot of times we don’t hear or know about them but they are happening, and they will probably continue to happen. Now, what the protesters today would say and what some people said then, especially politically engaged people, was ‘this is the government of Egypt, we’re Egyptians, and the government is serving the IMF and not serving us. Bread subsidies are something we need to survive, and they [the government] should preserve them’. This is a pretty potent argument, and arguments like that will continue to be made. Prospect: Governments’ responses to these democratic protests have varied widely in their use of violence, from the relatively moderate response of the Tunisian government to the widespread brutality of the Syrian and Libyan regimes. What factors would you say explain this variation? Dr. Provence: It probably has to do with the degree of integration between the ruling establishment and those elements of the government that are endowed with coercive and repressive force. In the case of Libya and Syria, the intelligence agencies and the special division within the military’s destinies, well-being and interests are intimately bound up with the government. There’s no seam there. In Tunisia and Egypt this really wasn’t the case. In Libya and Syria if the government falls, the army falls, and the leadership of the army will be denied their privileges, may be objects of vengeance from their neighbors and may even become international criminals. A lot of these people don’t have Swiss bank accounts, so when the government says ‘you rise with me, you fall with me’, this is an argument that they take seriously. In Tunisia and Egypt that situation didn’t exist. There were civil society organizations and institutions that were not fully hollowed out by the government, and consequently there was some argument to be made that the Army could preserve itself: the government can change, but the Army can preserve its privileges. In Syria and Libya that wasn’t the case. Prospect: Speaking specifically about Egypt, one interesting theory argues that the Egyptian military’s close ties to the US military, specifically that a large portion of the Egyptian officer corp was educated at US military colleges, has been a moderating influence on its response to the protests. Do you find this theory credible? Dr. Provence: No. American military officers don’t have any problem killing Iraqi civilians, so I don’t find it credible. I don’t think that the US is a singularly enlightened element in the training of officers, actually. Sadly, that’s they way we’d like to believe it, but I don’t think that’s supported by the facts. I think that the armies in those situations are independent state institutions in the same way that the army in this country is an independent state institution with independent collective interests. The main one is survival and preservation of their social privileges and their prestige. So at some point the army in Tunisia and Egypt said that this guy is costing us more than we’re benefiting from him, and he should go. It seems likely that as a recipient of a colossal amount of American aid the Obama administration was able to make plenty of calls to generals and say, ‘listen, you don’t have to go, but he has to go. And if you help him go in an orderly way the Egyptian Army will still be in our good books. We have a relationship with you, and this isn’t going to damage it’. Those telephone calls were probably not made by the US Army, because the Army here, as in Egypt, isn’t supposed to be involved in politics. Those calls were made by people in the State Department, in the Central Intelligence Agency, and by people in the Administration. But those contacts that existed between the [Egyptian] Army and the US Embassy, the State Department and the CIA, those were the operative relationships, and they didn’t come out of being trained together at West Point and so on. Prospect: Would you say that the United States’ lack of a diplomatic presence in Syria for most of the last decade has been a mistake in light of the events of the past year? Dr. Provence: I thought it was a mistake at the time. There were many reflexive boneheads in Congress and the White House who said ‘our Iraq policy is a disaster and the Syrians are to blame, so we have to punish them and they way we punish them is recalling our ambassador’. It hurt the US much more than it hurt the Syrians. So it was dumb policy, and it’s possible that if there had been five or six years of diplomatic relations between the United States and Syria at a higher level, then the United States might have had more influence. But it’s probably unlikely. The French never left — the French are very engaged with what happens in Syria, and always have been — and as far as I know Assad isn’t even taking Sarkozy’s calls. So it might not have made any difference. Prospect: How would you asses the Obama Administration’s response to the Arab Spring. What did they do right, and in your opinion what could they have done better? Dr. Provence: Well, I think that they dealt with Libya and Tunisia quite well, far better than the previous administration would have done. I think that there is a tendency to support our dictators until they don’t do us any good, but we should take a lesson from the Egyptian Army. I think that there were plenty of people within the Obama Administration, likely including the Secretary of State and possibly the Secretary of Defense, who were critical of cutting Mubarak loose. But this was a losing hand. Supporting these people after their entire population had turned against them for legitimate reasons would have been a stupid policy. The United States is not exactly covered in glory in the Middle East in any sense of the word, but being against popular movements of democratic protest is a place that policymakers shouldn’t want to be, and they shouldn’t choose pliable dictators over demonstrating public movements, ever. So the [US] government deserves some credit for that — for being smart and agile in dealing with Egypt. In Syria they can’t do anything and they haven’t done very much. Robert Ford, the [US] ambassador went to Hama and probably kept some people from getting killed. That’s about the [most] they can do. I think the bombing of Libya was done for reasons that have to do with French politics mostly. It was an unfortunate situation: Qaddafi was extremely unpopular, and it would have been better to maintain a coalition of states including the Arab League, because if that had happened and the Libyans had been able to kick him out by themselves — and they might have been able to, and I don’t think it it’s conclusive that they wouldn’t have been able to — with just a no fly zone, that would have been better. If the Libyans had done it themselves it would have been better for them and everyone else, and it would have preserved a bit of credibility of the Western countries — of France, of the UK and the US — that is gone. When the next crisis emerges and there is felt to be a need to act, they won’t be able to get anyone behind them. The other thing that bothers me about Libya is that people on the right who are in France, England, and the US who are always eager to prosecute a Middle Eastern war will feel this was a success and that they can do it again because it’s actually the disastrous failures of the past that are the anomaly, and this proves that they can go work their magic with a bunch of bombs and have a good outcome. I think this is dangerous self-delusion. Title image by Flick user Jonathan Rashad, via Wikimedia. 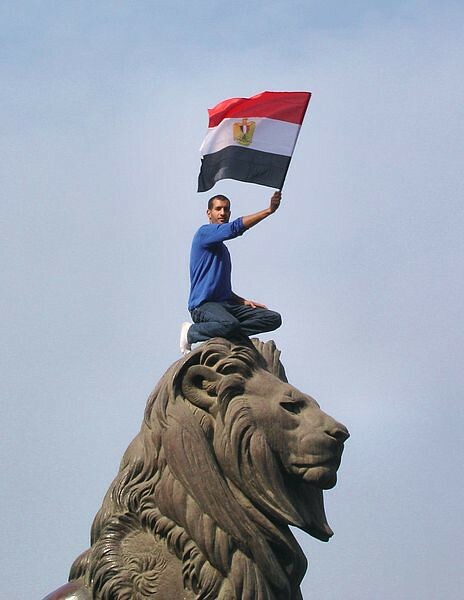 Egyptian protestor by Flickr user Kodak Agfa, via Wikimedia user Jbarta. ← ARE YOU A DIPLOMAT?